Varun Raman & Tom Hancock made the brilliant short film Transmission. It was a standout at the Sherman Oaks Film Festival in 2017. 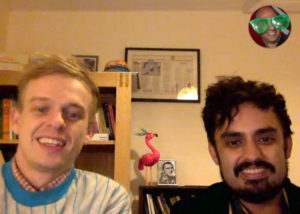 Even though they live in the UK, we hopped on Skype for a few hours to record an interview and a DIF4Q. What were Tom & Varun’s DIF4Q answers? Some they did as a team, some on their own.